The Dreamcast Junkyard: A Dreamcast "What if?" 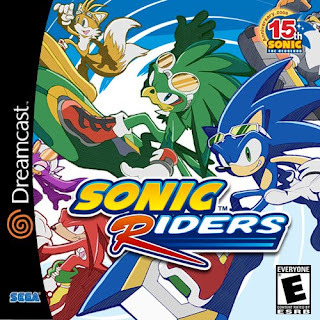 Had the Dreamcast lived on, would we still have had Sonic Heroes? This was a question I asked at the Sonic Stadium. I think its an interesting question, just as interesting as asking "In Back to the Future, what would happen had Marty knocked up his own mother?" Food for thought. I received some interesting replies. Some thought that Heroes would have come out on Dreamcast (exclusively, of course) and the rest of the games we have now would have followed suit. 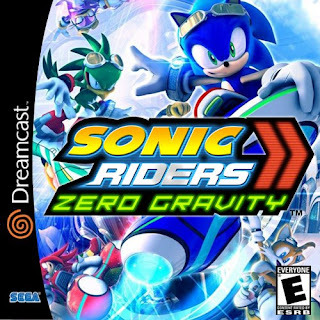 Sonic Riders Zero Gravity would have been the last Sonic game to appear on the Dreamcast, and we would have been treated to a much better Sonic '06 as a launch game for the Dreamcast 2 or Sega Cyclone or Sega Infinity (basically Sega's next step after the Dreamcast). 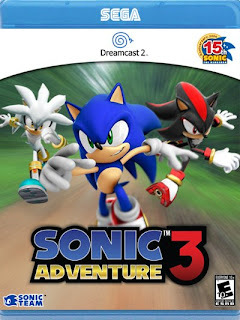 Others believed that we would have been treated to a Sonic Adventure 3 with a plot similar to Sonic Heroes and gameplay that was more in line with Sonic Adventure 2. This led to a bit of complaining over how some Sonic fans believe that Sonic Adventure 3 is just a fanboys answer to the perfect Sonic game that never happened. Those who think a third entry in the Adventure series would have saved us from "the dark times" are complete loons who are better off wishing Sonic & Mario would team up (wait, nevermind that last part). This discussion inspired me to design boxart for Dreamcast games that might have been, had the console and Sonic series lived on together. Enjoy! ...and I still wonder what "Sonic & Knuckles RPG" would have been like? I love the Sonic Adventure 3 box. I wish it were a reality. Yeah! 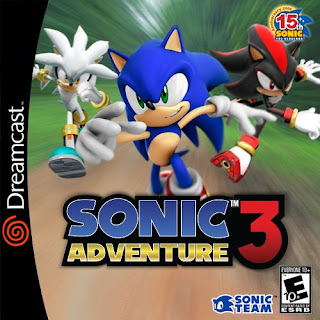 I imagined that SA3 was one of the final Dreamcast games, created as a last hurrah for the Dreamcast and as a transition to the Dreamcast 2. Sonic Team made the odd decision to release the game on both platforms, thankfully this plan worked. DC1 fans who could not yet afford a DC2 were glad to have the game while DC2 fans enjoyed an enhanced version of SA3 complete with online multiplayer and enhanced graphics. Ooooh! Is that Sonic Adventure 2/Dreamcast 2 box the PAL version? Is it on a blu-ray disk or some new-fangled propriety SEGA disk? I WANT IT NOW!!!! But alas, inside I'm weeping. I meant Sonic Adventure 3. D'oh. According to Future Wizard, who I have just spoken with, The Dreamcast 2 reads Blu-Ray, DVD, GD-rom and CD-rom. Apparently it released 8 months before the PS3 at a very competitive $399. The system held a 60gb harddrive with an optional 120gb model for $499. It featured built-in wi-fi as well. Oh! And I was also told that the system was a joint venture with Microsoft. 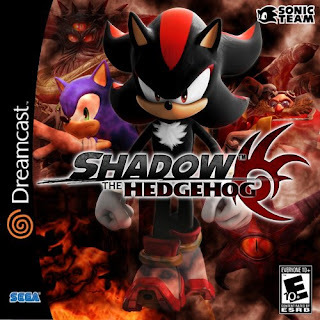 Shadow the Hedgehog would have been so cool to play ! Most of those Sonic games were a bit pants though, so I'm glad they never did hit the Dreamcast. Virtua Fighter 4, toejam & Earl 3, Panzer Dragoon Orta, JSRF and Outrun 2 however..
That means sega would be releasing seven sonic game on one console! Makes one wonder, though, would the pants games be better had they been on the Dreamcast? I really wonder what Heroes would have been had it been for one platform and not developed amidst a company restructuring. I'm certain Secret Rings and Black Knight would have never existed, as those were made as an alternative to the HD Sonic games. I think if the games were built for one console only and made to not only sell software but the hardware too, the games may of been a little better. I mean the graphics of Heroes seem to take a dive after SA2. Saying that, even with SA1 Sonic Team were rushing their games out rather than giving them that extra time to improve them further and iron out bugs. I also think we would still have ended up with the Shadow and werehog game ideas. The reason sonic 06 was such a mess was because half of the staff were moved into he secret rings project half way though. That game would have still sucked no matter how much extra work went into it though, based on the terrible story it had alone. Probably Ujn Hunter, the Sonic series was Sega's best series. I still miss Sonic Adventure, can't get my hand on an affordable Dreamcast (saw one that had four controllers, 3 VMUs and 350 games, the guy aksed 300$ for it). @Seikyo Jack: Have you looked on ebay? You should be able to find lots of bundles for under $40. Or check Racketboy's forums. Heck, I bought a Dreamcast, controller, VMU and three (albeit awful) games for $30. $300 is a joke, unless tons of rare games are included. As for Sonic, I'd say it's Sega's most prolific series, but not the greatest of all things Sega. I'm tempted to place all the 3D Sonic games behind the two Jet Set Radio games. As for the 16-bit games, Sonic is pretty much the greatest.